lly hard on wildlife, which need extra water put out at our bird feeders to survive. But there is one very big upside of the drought from my point of view. I have found two plants that I have been looking for since 1994. I have recently rediscovered two plants first described in 1911 by the highly respected Westford botanist, Miss Emily Fletcher. Emily Fletcher was known about town as the lady who hiked up her long skirts and tramped through the fields and wetlands in search of rare plants. Women were not at that time invited to be members of the New England Botanical Club, so when she had an identification question, she sent her plants to men who were members. Her letters were often published in the club’s publication, “Rhodora”. All of her 630 pressed specimens, most from Westford, were donated to the Gray Herbarium at Harvard University at her death in 1923. Emily Fletcher reported in a 1911 entry to the “Rhodora” that she had found “a rare grass, Juncus pelocarpus, which occurs only on the bottom of the middle of Grassy Pond when it is dry”. She also reported Rhexia virginica also known as Virginia meadowbeauty. When I read this report in 1984, I hadn’t realized that Grassy Pond ever dried up. Since then, I have found that the pond does almost dry up occasionally, and therefore is classified as a vernal pool. In the 22 years in which I have been searching for this plant, however, Grassy Pond was never dry in the middle. This year, eureka! The pond is completely dry and one can walk right out to the middle. We walked out there recently and found a plant that looked a lot like Juncus pelocarpus as illustrated in my Gleason and Cronquist Manual of Vascular Plants of Northeastern United States and Adjacent Canada. I took multiple photos and sent them to Arthur Haines of the New England Wildflower Society. 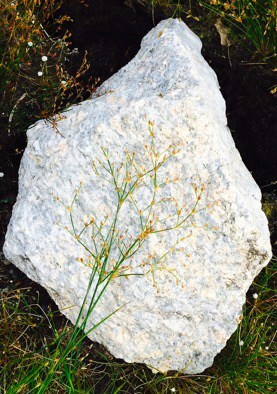 Mr. Haines, who is the author of Flora Novae Angliae confirmed that the plant is, indeed, Juncus pelocarpus. He told me that it is actually a rush, not a grass, and that it is also known as Brown-fruited Rush. He said that it is not on the state list of rare plants, but is uncommon, due to the fact that it only grows in seasonal wetlands. The also uncommon Virginia Meadowbeauty is much easier to identify, and my Peterson’s Field Guide to Wildflowers was all I needed for that. Its a beautiful, startlingly bright pink mass of flowers blooming at Grassy Pond’s margin. Emily Fletcher was an important contributor to the publication Flora of Middlesex County. At the time of her death at the age of 78, she was movingly recognized by members of the Botanical Club. You can find out more about Emily Fletcher by reading companion papers titled “Emily Frances Fletcher” written by Jean Downy and Marian Harman in 1994. It is available at the Fletcher Library.